(CNN) - Two days after telling more than 20 families they had lost loved ones in one of the nation's deadliest school shootings, Connecticut Gov. Dan Malloy on Sunday urged stricter gun control legislation at the federal level. "These are assault weapons. You don't hunt deer with these things," Malloy said on CNN's "State of the Union." "I think that's the question that a lot of people are going to have to resolve in their own minds: Where should this line get drawn?" Malloy said the gunman in the shooting at Sandy Hook Elementary School in Newtown, Connecticut, used guns that had been legally purchased by his mother, who was among the dead. Police said the gunman shot his mother before killing 20 students and six adults at the school. The suspect, Adam Lanza, was found dead next to three guns - a semiautomatic .223-caliber rifle made by Bushmaster and two handguns made by Glock and Sig Sauer, a law enforcement source told CNN. 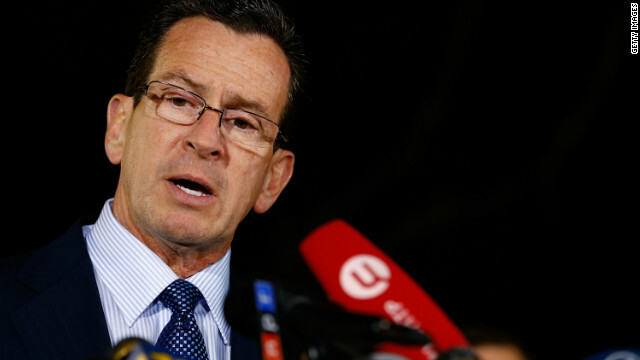 The Democratic governor pointed to Connecticut's assault weapons ban but argued the lack of a similar law at the federal level makes it difficult to keep such weapons out of the state. He said manufacturers can use "descriptive terms to try to get around the limitations that are built into our statutes here in Connecticut" and added that many guns found in the state had been tracked from gun shows in other parts of the country. "One can only hope that we'll find a way to limit these weapons that really only have one purpose," he told CNN chief political correspondent Candy Crowley. The 1994 federal assault weapons ban expired in 2004, and multiple attempts to renew the legislation have failed. President Barack Obama supported reinstating the law as a presidential candidate in 2008, but gun control has yet to rank a top priority on his agenda. Since Friday's shooting, however, Obama has signaled a potential shift in policy. "We're going to have to come together and take meaningful action to prevent more tragedies like this, regardless of the politics," the president said in his weekly address Saturday, echoing remarks he made Friday after the tragedy. In Congress, multiple gun control bills have been introduced in recent years, but not a single one has advanced to a floor vote. Asked if the recent tragedy has forced state authorities to consider hiring security personnel in schools, Malloy said it was "a little bit early to say what we can take away from this" in terms of security lessons. "This is a violent world. We are a particularly violent country within that world. If someone wants to do an act like this, they're going to find a way to do it," he said, pointing to the fact that the gunman "shot his way into the building." As families gathered at a nearby firehouse Friday to hear word on their loved ones, Malloy found himself being the one tasked with delivering the bad news to relatives of the victims. Growing emotional Sunday morning, Malloy said it was a moment "he will live with for the rest of my life." "You can never be prepared for that - to tell 18 to 20 families that their loved one would not be returning to them that day or in the future," he said. However, he added, "You go on." - CNN's Brianna Keilar and Gregory Wallace contributed to this report. Most of the American people join in his views, but our politicians are scared of the NRA, because of their jobs may be lost. If every lawmaker decided to join together and speak out against the NRA and it association, change can be made. It will take loud voices to make changes. The NRA is nobody if they don't have support. This is the same with Norquist and taxes. Our politicians make him and the NRA strong with their actions. Lets change this today. We cannot allow a few organizations to run our nation, and they all are about trashing this nation, not buiilding up. Support Obama and all our lawmakers and make history with better, stronger laws. Of course the NRA will scream about the 2nd amendment. but they have stretched the meaning of the 2nd amendment too far. My heart is broken for all the citizens of Conn. No parent ever suffers a greater pain than the loss of a child. The hurt never goes away-you only live with it and go on. No private citizen should be allowed to own any assault weapon-period. NO ONE should be allowed to purchase a gun of ANY type without a THOROUGH background check. There should be at least a 30 day waiting period. Any politician, from congress down to local officials, who has taken money from the NRA has a certain responsibility for the deaths of 20 children. You shouldn't be able to sleep at night or look in a mirror. As a single gun owner, I would never advocate a gun ban, however, it is way pass time to reassess the need for the general populace to own assault rifles and extended ammunition clips. I am not sure what the answer is, but i am sure it should be discussed. All of you that support private ownership of assault weapons, need to take a close look at little Emilie, then imagine the carnage on that sweet angel's face after 11 bullets fired in rapid succession. Imagine, if you can, the horror of witnessing this horrible assault on her friends and more unspeakable, imagine the terror she experienced while awaiting her turn. And before you yammer on about madmen will use knives to kill, and cause mayhem, let me point out that on the same day, 22 Chinese children were indeed attacked by a knife wielding assailant, and all survived. It is indeed a sad day, and all of America should weep, when we pray, if only the Sandy Hook madman had attacked 20 first graders using a knife. There must be a societal shift after this, we cannot let this slaughter of innocents be for naught! Gun-control law is indeed needed here. Stop lobby with silly arguments. What is an 'assault weapon'? Can you describe specifcally what that is? Is it the black color? The little handle you grab below the trigger? It cant be the caliber or the actual functionality, since just about every firearm operates in a similar way. These arms are in common use and owned by millions of people. People that break no laws with them. Millions and millions of people. They are also protected under the Constitution. Restricting civil rights is a fun mental exercise, but tricky in real life. NRA is an Association. All ist members advocate everyone must live and no abortion. If they are sincere of what they advocate, this is the time when they will come forward forcefully and stand to what they believe in. No one should advocate for the life they have not seen yet and ignore those lives which were brought to earth already and are claimed in a brutal way. "I am not sure what the answer is, but i am sure it should be discussed." Oh, it's being discussed. Those for gun control are demanding Obama fix the problem all his lonesome by "doing something - anything". Those against gun control are demanding Obama fix the problem all by his lonesome by "doing nothing - nothing at all". Meanwhile, the one who was responsible for the mass killing of 6 and 7 year olds is getting a free pass. As is the person who legally purchased those weapons used ... for her own protection ... and ultimately her own death. And the United States Congress is once again afraid of it's own shadow (and their NRA lobbyist friends) by refusing to address where they stand. The answer is not FEDERAL LAW but STATE & LOCAL law. Ballot initiatives on the state level ; particularly in BLUE states can outlaw guns, oulaw ammunition, outlaw high capacity clips. Then when people from other states violate those laws whether by mail order, internet, interstate travel, interstate flights, etc. lock these people up. GOP you can't compare China to USA. In China the government owns all the guns and the citizens have none. I do feel deep compassion for the victims and the families. The killer stole the guns from his mother whom he killed to get those guns. With the internet anyone with half a brain can change a rifle from single shot to semi or auto. Smaller magizines just means they have to carry more ammo but can still do a lot of damage. There are no easy answers or solutions. I offer these ideas: before you can get a gun you first must apply for a permit to purchase so more through checks can be made. Give gun shop owners some kind of database they can quickly check for criminal or mental health records. Work with gun makers to create weapons that can never be converted from single to auto. Outlaw converison kits for these types of rifles. States should outlaw all gun sales at flea markets and such. It is a start and it really doesn't infringe on anyone's rights. Just closes up some loopholes I know of. Any weapon that has a magazine that holds more then 7 rounds would be a start. Any weapon who's design and purpose is for combat " military ". They are designed for the Military and the Military only should have them. The NRA is like big Tobacco companies , Do you remember when cigarets didn't cause cancer ? The NRA- or inanimate guns had nothing to do with this or other like events. I surmise that we would have fewer such events if our governments would champion standards rather than laws that do not nor will not solve this problem. The failure is one of intellect not gun laws and those intellectual standards that cause this are the progressive liberal ones and criminal behavior not the standard liberal mantra of NRA! It will be a sad day for this nation & it's citizens if we don't have a serious discussion about gunviolence, starting right now! We can't honestly be saying that we love the 2nd amendment more than human life, can we!? In a civilized society, it should not be this easy to blow people away like dust, in less than 60 seconds! Haven't enough human life been sacrificed this year, in very Preventable circumstances! They were not only tragedies but travesties! Gun Control has to be discussed & resolved, starting w/ the loose interpretation & lax enforcement of excisting gun laws! Or must more innocent adults & children sacrifice their lives before we & Washington see reason!? The problem is much deeper than guns. We used to be a nation of high morals and now anything goes. We used to all work together on every problem now let government take care of it. We used to look out for each other and now it is everyone for themselves. Even criminals had a line they wouldn't cross and now that line has disappeared. Because we are so dependent on government to take care of us we have forgotten how to fend for ourselves. Social mores have all gone out the door. The stresses and problems of living have caused many to become killers. We have given so many sick people their "rights" we can't even force them into help even though we know they could become killers. So it isn't guns-it is the collaspe of the way we used to live to how we live today. The last election showed this-50% want government to take care of them and 50% want to take care of themselves without government help. What the NRA doesn't want people to remember is that the Constitution is not Scripture. It was not handed down on stone tablets. Indeed, the founding fathers recognized it as a creation of men and inherently flawed and in need of constant review and open to revision. By the very FACT that this so-sacred SECOND AMENDMENT is.....you guessed it.....an AMENDMENT. It was not part of the original document. There have been many, many other amendments passed as the nation recognized the need. Thus there is nothing intrinsically holy about the 2nd amendment and given the way its verbiage has been twisted and misapplied to further particular parochial interests, nobody can claim to have a pipeline to the 'truth' as to what exactly is its correct interpretation. One thing for sure, nobody, including the NRA, gets to abrogate our FIRST AMENDMENT rights to bring up the topic for debate and discussion. They act like we are victimizing them and treading on their rights by floating ideas as to how to make our country and society safer and better. That's treason. He has raised a legitimate question; Where do we draw the line? Right now it's illegal to possess explosives and full-auto weapons without a special license, so there is a line of sorts. Banning and confiscation is extreme and impractical, so that's out. But somewhere between a total ban and no limits is a better middle ground. However, when guns are outlawed, crazies will make bombs. If this massacre doesn't get some honest talk about gun control, I don't know what will! I feel like 20 babies gave their lives for the 2nd amendment! That can't possibly be the way we interpret it! Last week I was in a resturant & found myself hoping no1 would open fire, a few months ago my family went shopping & my mom hoped "we don't get shot"! These are real concerns for all Americans, these days! So much gun violence is preventable & we, as a nation must have an honest discusion about it! It's the legacy of this years gun victims!! There is no legitimate reason for anyone not in the military or law enforcement to own an assalt weapon. I remember a bumper sticker years ago that had 2 lines that read, "Guns Don't Kill People, PEOPLE kill people". Even as a kid I always thought a better sticker would have included in parenthesis, (PEOPLE With Guns"). Some people will tell you that gun control is not the answer, and point to other countries, and say "look, they have shootings there, too". Yes, we do. But less often, and not on the same scale. When a local taxi driver lost it and went on a shooting spree, he killed 12 people and injured 11 more. He used a 12 bore sawn off shotgun, and a .22 rifle. Because that was what he had available to him. Had there been military grade automatic weaponry in his house, he would have used those. In that case, the casualty count would have been unimaginably higher. A very genuine topic of conversation, in the dreadful aftermath, was "thank god those were the only weapons he could get....it could have been so much worse". I cannot imagine what those families who have lost children are going through, and they are very much in my thoughts. But I don't need to use very much imagination to know what the community is going through: shocked, vulnerable, despairing, they have had their lives invaded by tragedy, and now must endure the second longer invasion of privacy as the verminous vultures of the press descend, shoving microphones in the faces of traumatised children, in search of the "human interest" angle. Our hospital, which treated our survivors, was under lockdown for a few hours due to the gunman, but for days thanks to media idiots trying to invade the privacy of the victims, living and dead. But what we learned was that if you come together, and lean on each other, the community can stay strong. And you will need that strength. In the United Kingdom firearms are tightly controlled by law, and while there is opposition to existing legislation from shooting organisations, there is little wider political debate, and public opinion favours stronger control. The British Shooting Sports Council now believes that the law needs to be consolidated but it does not call for a review. The United Kingdom has one of the lowest rates of gun homicides in the world with 0.07 recorded intentional homicides committed with a firearm per 100,000 inhabitants in 2009 compared to the United States' 3. (1) Redesign schools- Each classroom should have a window large enough to pop open for children to escape, like a school bus escape hatch. Also, auto-lock doors for classrooms when a teacher hits a button. (2) School shooting drills- Needs to happen. More dangerous than fires nowadays. (3) Ban on semiautomatic and automatic firearms. Or for those that want the least intrusive way, limit the rounds that can be fired off circulated guns. (4) Direct lines of communication between school principals and the police station. We should be taking a look at mental health more... Besides guns. All these killers had mental health issues that went undetected. If someone is mentally unstable and want to kill a bunch of people they will find a way. Bomb, cars, knifes. We need to look at people around us and notice if things don't seem right. When we stand by and do nothing for those that need mental help this is what happens.